In line with its mission is to organise sailing and yachting events in the clean waters of the Mediterranean, Yachting Events Limited have today announced the launch of the RC44 Valletta Cup and the Yacht Racing Forum which will be hosted in Malta in November. The RC44 Valletta Cup returns to our waters after having successfully debuted in 2015. The Cup, which forms part of the five location RC44 Championship Tour, is undoubtedly one of the most prestigious events which has left its mark in the world of international yacht racing. The Tour brings together the world of business and sport to a competition that sees top entrepreneurs and Olympians and America’s Cup veterans, the likes of Cameron Appleton, Michele Ivaldi and Ed Baird, battle it out on the water. Racing on one design boats, it is the skill and acumen of the RC44 boat crews which yields the final outcome of each race. The Tour, which is celebrating its tenth year, will close in Maltese waters. 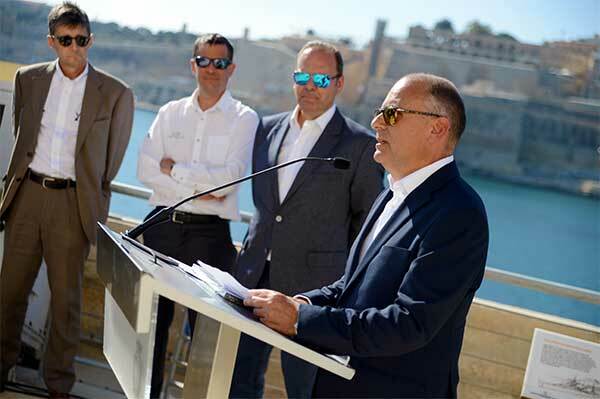 “It is with great pride and satisfaction that today we are launching these two prestigious events, the RC44 Valletta Cup and the Yacht Racing Forum. The RC44 Class, together with their long list of passionate and highly decorated sailors will return next November. The second event which we are immensely proud to present is the Yacht Racing Forum” announced Mr. Niki Travers Tauss, Director, Yachting Events. “It is with pride and gratitude that we announce the support, for yet another year, from the Ministry for Economy, Investment and Small Business with whom we will be co-hosting the RC44 Valletta Cup”. Within 24 hours of the end of the RC44 Valletta Cup the Yacht Racing Forum will take the limelight. Co-hosted by Yachting Malta, the Yacht Racing Forum is the leading annual international conference for the business of sailing and yacht racing and is recognized by the international sailing body World Sailing, formerly known as ISAF. The Forum brings together key players from across the whole yacht racing industry, facilitating business development through quality networking opportunities with decision makers from all areas within the industry. The world's best sailors, yacht racing industry opinion leaders, the sport's most involved sponsors, prominent exhibitors and great networking opportunities are expected to attend this year’s Forum in Malta. “The staging of these events shows the direction in which Malta is moving. We are branching out beyond traditional tourist activities, we are showcasing our superb natural harbour and we are developing facilities which will enable us to build a strong reputation as a place of high quality and added luxury” remarked Hon. Dr. Christian Cardona, Minister for the Economy, Industry and Small Business “Behind the glamour is something more solid -- a strong economy. We now have one of the highest growth records in Europe. Our economy is powering ahead, new businesses are being created, older businesses are expanding, more people are in work and fiscal structures are being tightened”. The Press Conference was also addressed by Mr. Bertrand Favre, RC44 Class Manager, Mr. Bernard Shopfer, CEO – Yacht Racing Forum and Mr. Wilfrid Buttigieg, CEO of Yachting Malta as co-hosts of the Yacht Racing Forum. Yachting Events also announced a number of sponsorship tiers, offering varying degrees of benefits to corporate organisations who wish to take advantage of the exposure and networking opportunities such events have to offer.